A playwright friend of mine once said, “without conflict, there is no drama” – and as we all know, inspired works can take many forms: spiritual, emotional or academic . . . even physical – and terms such as restoration, renewal and reawakening have been used in relation to the effect the following events produced in myself and members of my select audience. Prologue A dire prognosis and the likelihood of enduring lengthy bodily discomfort and pain – with only palliative care to provide relief. All the while searching insufficient available resources for answers – discovering if not creating and implementing your own therapeutic protocol. This “calling” must lie in stark contrast with my early-detected proactive strategy – yet nevertheless, emotional and future issues always weigh in pretty heavy with the C-word. Mesothelioma attacks the membranes (mesothelium) which surround body organs or the membrane that lines an enclosing body cavity. The cancer cells can invade and damage nearby tissues and organs and also metastasize from their original site to other parts of the body. And as the mesothelium produces a lubricating fluid that is released between these layers – allowing moving organs to glide easily against adjacent structures – compromising this function could indeed cause a patient much pain and suffering. One could visualize Rhio O’Connor’s extraordinary legacy as a steady, bright fixed beacon guiding unsettling thoughts safely through a dense fog. Diagnosed with mesothelioma and given a year to live, Rhio carved a unique path to a healthy quality of life and outlived his prognosis by seven years. 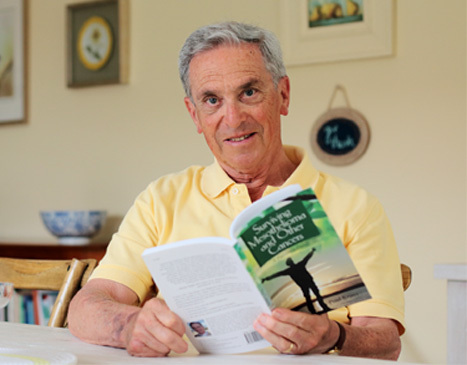 In his book, “They Said Months, I Chose Years: A Mesothelioma Survivor’s Story”, Mr. O’Connor chronicles what he did to live with mesothelioma and much of the science behind his actions. Issues documented in the book compel us to consider other ways to manage cancer and extend life beyond conventional surgery, chemotherapy or radiation. This intellectual work along with Rhio’s optimistic spirit, a belief in something greater than himself, and the ability to make tough choices helped him beat his prognosis. Though perhaps not particularly entertaining or sharing in a high celebrity quotient value, it would be a favorable review in that after my diagnosis of prostate cancer in July, 2006, the ensuing drama would have a relatively short off-Broadway run. The prognosis was good, the tumor was found early and contained within the prostate. My major conflicts were wrestling and overcoming feelings of uncertainty and despair while focusing on selecting and believing in an appropriate treatment. The hopes and desires once any cancer is removed, is to achieve and hopefully sustain an acceptable quality of life. Three days after receiving my diagnosis, I was “let go” from work – a minor setback – putting a slight dent in financial reserves. My wife was working, we shared in good medical insurance coverage and I had a workable window within which the drama could play out. Over the next few months I conducted my treatment research: physician interviews; surgical abstract readings, protocol and side-effect reviews; family, friend and patient conversations; and much, much soul-searching, with the goal of becoming resolute and comfortable with a treatment decision. I chose the recently FDA approved (c. 2000) da Vinci robotic-assisted prostatectomy. An interesting robotic back-story was also uncovered during online research. In the 80s, first efforts by NASA researchers and Stanford engineers were to develop a surgical system to improve dexterity in microscopic hand surgery. The US Department of Defense also got in the mix, as they wanted remote-operated surgical capabilities. The Military design was intended to be a battlefield surgical system in which a mobile robotic system remote-controlled by a surgeon could do lifesaving vascular surgeries away from the frontline. Though not further developed in the military, it led to the eventual development and marketing of the da Vinci Surgical System. Upon this surgical discovery and prior to recent “media marketing” I too, wanted to take advantage of this pioneering effort and less-invasive technology – my surgery took place in November, 2006. I was indeed fortunate and blessed! – the prostate was successfully removed with the desired negative surgical margin, and I was basically told that I’m good to go. Encore? . . . to be scripted. It is now, February, 2010. My wife, who’s love and support helped boost my confidence during my struggle, has been diagnosed with breast cancer. Now confronted with her own unsettling fears and conflicts, she’ll write and stage her own drama. And as bleak or overwhelming a scene may appear, I’m poised to provide my unwavering support and assistance – I’ll be at her side. We’re all pullin’ for ya honey. So . . . guess I’m a cancer survivor. It would be gratifying to succeed in any effort to ‘pay forward’ receipt of such quality care. A core life goal foundation has always been to respectfully provide for my wife/family. Academic and career goals have evolved in pursuit of ongoing education that can equip one to adapt, contribute and compete in our rapidly evolving workplace. I’m continuing my education to prepare for a career change and re-entry into the workforce. And, as we’re witnessing our current healthcare system undergo major overhaul, I’ve selected Health Services as my major. Successfully completed coursework will be further beneficial in that present transferable skill sets will be further enhanced. Augmenting and integrating acquired knowledge helps shoulder the oncoming challenge and I’m confident a versatile experience can converge successfully in any market.